Matching a picture with a name is much more grueling than just doing the genealogy research. This man's name is William Williams...we were told. We know about the William and Williams surnames. We know that the Williams surname in the United States is common, as it is in England and in Wales. Williams became common in Wales where they added the “s” to denote “son of” to their surnames. However, none of this surname history has helped me identify the elusive William Williams (Bill Williams) or the man in photo. For this reason, I am calling on all Williams. Can you identify the man in this 1944 photo as having a branch on your tree? With Kansas having its share of Williams, and plethora of William Williams, we need a positive identification of the man in the picture. 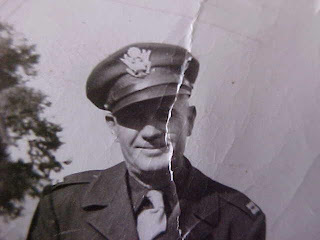 William Williams, or Bill Williams, was donning a WWII uniform in 1944 and appeared to be around 50 years old. He was originally from Reno County, Kansas. A positive identification of this photo with proof of evidence. Truly, military records aren’t needed, unless someone can positively identify this man, or if the military uniform hints to his service. Identify your family pics and put your stories on paper. What good are dates and pictures without the story? Could He Pass for White ?